Just hours before departing on a cross country bike tour, local music legend Alex Bice released his debut album, Canyonlands. Under the moniker “Xander Bice, this surprise album provides a perfect summation of what Bice means to the Santa Cruz musical community, The record is in true DIO-fashion, as he recorded and produced it himself from the foyer of a mountainside co-op just east of town. In notorious Bice fashion, his impactful and enigmatic tone was left as a gift for us to enjoy and remember him by as he embarks on this next adventure. As the album title would suggest, his album exhibits the transcendental. Recorded solely with analogue instrumentation and equipment, Canyonlands transports you into the sobriety of nature. Its rawness yet hi-fi quality offers something that can only be achieved through the clarity of vision – unpolluted by the crowd of opinions and direction we encounter everyday. Just as majestic landscapes can render you speechless, Canyonlands is purely instrumental. Laden with articulate yet playful melodies, astute yet peaceful atmospheres, and gritty yet polished performances, Canyonlands, illustrates everything that music and art has always been and will always be. In his album there is a universal language that needs not translation, just an ear, just someone to listen. “Sosumi,” the opening song, features a whimsical, spaghetti-western melody played on a xylophone. Between the instrumentation and the clever song title (a sardonic nod to the chime soundings of Mac computers and lawsuit concerning the name of that sound, so – sue – me), “Sosumi” could serve as a mission statement. Bice immediately invokes youthfulness in the wild. We are brought into the safety and innocence of a child wandering through the beatific desolation of the new frontier. 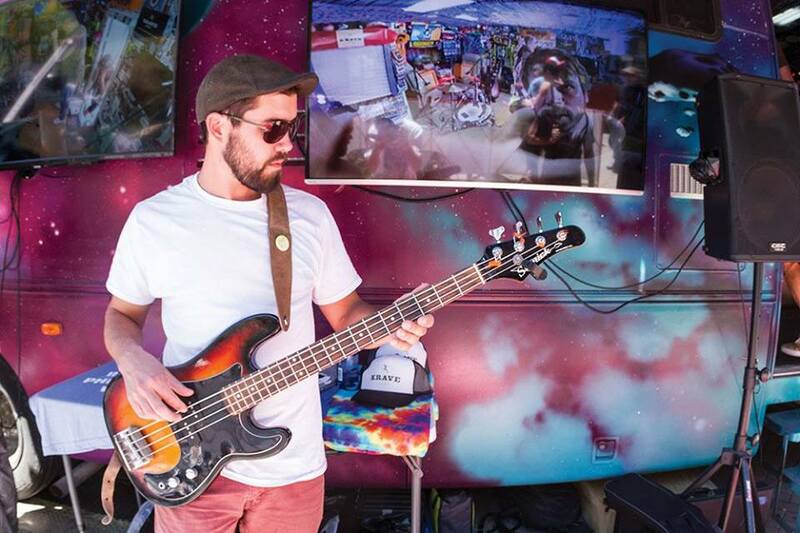 His second song, “Heat Shimmers,” has an Afro-beat kick off before launching into jazz-fusion with a quirky funk. This song sends several percussive and sonic sprites fluttering around your ears as it transitions through its genre themes. Third on the album is a track called “Mediocre Flying Dream.” Between drunken saloon piano riffs and a slippery stand-up bass, Bice effectively solicits the image of a lone watering hole setting, deep in the depths of a remote desert location. As the song finishes you’ll likely be picking some tumbleweed from your teeth. “Marina,” is a hallucination painted on the twilight. Guest artist, Matt Takiff, lays down a smooth and articulate saxophone solo, eliciting Don Juan’s shadow gesturing for you to follow him into his coyote dreams. The short album ends with the title track, “Canyonlands.” Featuring a flirtatious banjo and Matt Takiff back on the sax, we are left in the sublimation of the wild. There is no end in sight, only the limitless expanse, freedom, and exhalation. Having grown up in Watsonville, CA before attending UC Santa Cruz, Alex Bice became locally renowned as a musician and recording engineer. 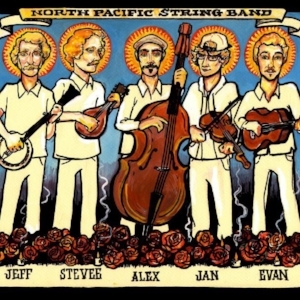 From his early days at UC Santa Cruz, Bice played in several bands as a bass player and a drummer, including a bluegrass outfit called the North Pacific String Band as a bass player. The group contained DIO Fest specials, including Jan Purat, Stevee Stubblefield, Evan Penza, and Jeff Wilson – each one of them, becoming the bedrock of the burgeoning DIO community. Bice was quickly respected for his unique, diversely talented musical ability and likewise, for his precociousness as a recording engineer. This ability to record was especially instrumental (forgive me the pun) in defining the concept of DIO Fest and the quality of production that was to follow. In these early sessions, he recorded several local acts in the collective, which contributed to the first publications of the DIO Fest archive — then known as the North Pacific Collective. Since the dissolution of those earlier bands and the rise of DIO Fest, Bice joined Steep Ravine as the bass player and maintained his role as recording engineer for the festival. As both Steep Ravine and DIO Fest grew in prominence outside of Santa Cruz, Bice remained the reticent mercenary and conveyor of high-quality sound. After years of success, Steep Ravine dissolved. Alex then turned his attention to recording. Over the course of a year he converted his foyer bedroom into a fully functional, analogue recording studio. In this time, Bice decided that it was time to record his solo album, now known as Canyonlands. Day and night he tinkered away with sounds as vast as an electric guitar drenched in oceanic reverb to sounds as acute as the sibilance of tiny bells attached to an ornate sofa cushion. This went on covertly, until being released just before his final Sunday morning as a Cruzian resident. Though Bice’s album release came as a bittersweet event, his contribution to the Santa Cruz music scene and DIO Fest remains an enduring example of someone making profound connections, beautiful art, and a meaningful life with what they got. All of us, like Bice, have something to offer. We have art. We have community. That embedded within our very nature is the drive to connect. Above all else, Canyonlands offers one salient truth. That art is the bond of living, born into us from our first breath of light. 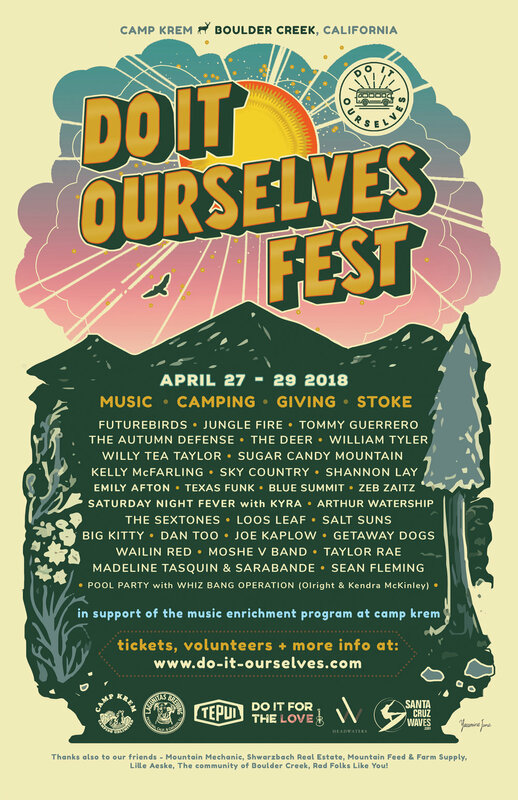 DIO Fest 2018 - Tier 3 tickets available now!